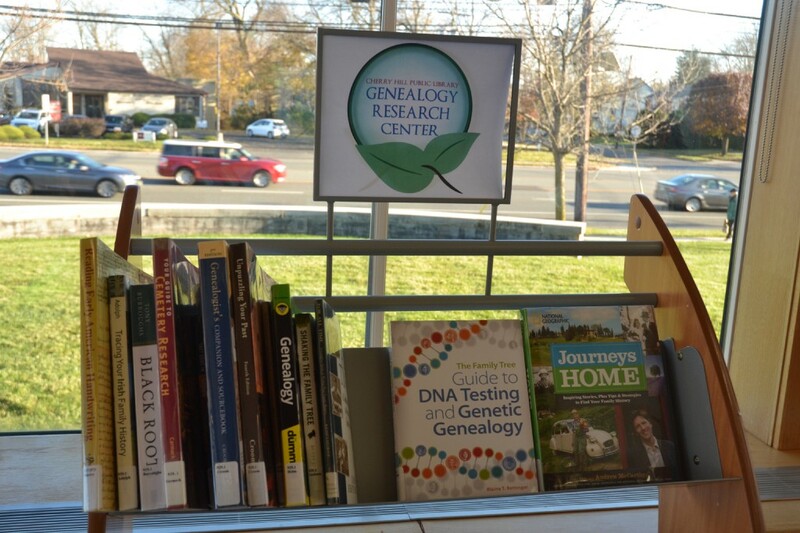 The library’s new Genealogy Research Center was paid for with a $15,000 donation from the Friends of the Cherry Hill Public Library gift shop after the gift shop closed its doors in January. 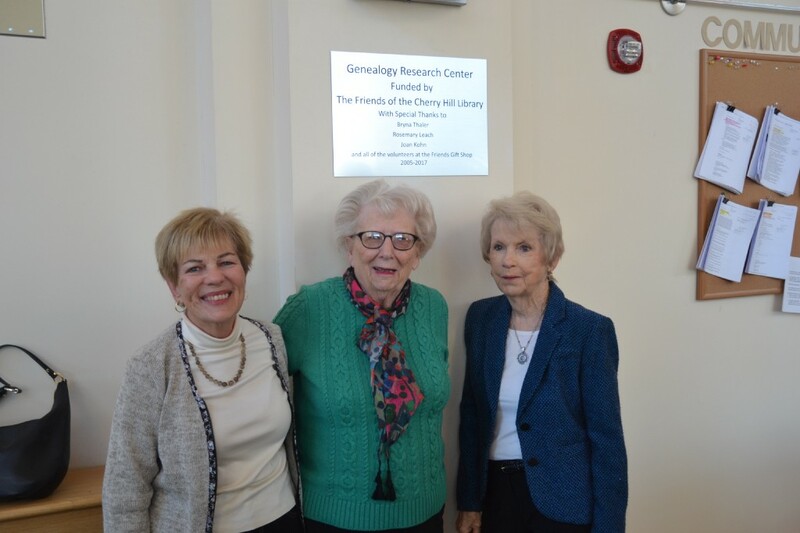 Friends of the Cherry Hill Public Library volunteers Joan Kohn, Bryna Thaler and Rosemary Leach pose under the sign for the library’s new Genealogy Research Center. The center was created through funds from the Friends Gift Shop, which Kohn, Thaler and Leach ran for a number of years. The opening of the Cherry Hill Public Library’s Genealogy Research Center last Tuesday also marked the end of an era for the Friends of the Cherry Hill Public Library. For more than a decade, the Friends organization, a nonprofit dedicated to raising money for the Cherry Hill Public Library, operated a gift shop just inside the library’s main entrance. The gift shop was a big part of Friends’ overall fundraising effort, generating thousands of dollars in donations for the library. In January, the gift shop closed after more than 11 years of operation. Last Tuesday, the library unveiled its Genealogy Research Center, a new venture paid for from the last remaining funds from the Friends’ gift shop. Present at last week’s ceremony were three Friends of the Cherry Hill Public Library volunteers, Joan Kohn, Bryna Thaler and Rosemary Leach. The three were responsible for operating the gift shop. Two of the volunteers, Thaler and Leach, had been involved with the shop since it opened in 2005, just months after the opening of the library’s current building. Friends opened the gift shop to give community members a place to purchase small items such as jewelry, scarves, books, electronics and more. The proceeds from the Friends shop funded various projects around the library. Running the shop wasn’t easy. Leach described it as nearly a full-time affair, as she, Kohn and Thaler would purchase items from trade shows to stock the shop. The three also had to coordinate volunteers to staff the shop during its operating hours and make sure the gift shop was making money to generate funds for the library. 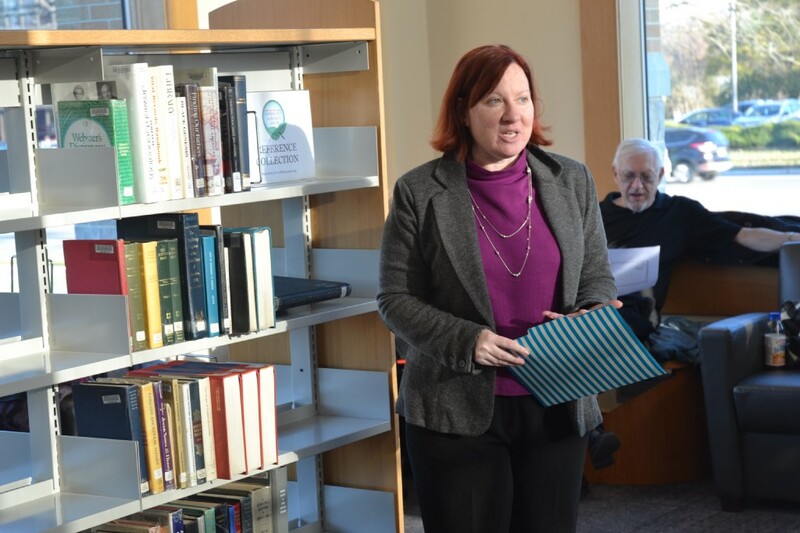 Cherry Hill Public Library Director Laverne Mann discusses the library’s new Genealogy Research Center during its unveiling last Tuesday. “It was just like running a small business,” Leach said. The idea behind the gift shop was the lack of similar stores in the area. Kohn said the gift shop was meant to be a place where a community member could grab a small, inexpensive gift quickly for a family member or friend. “We tried to keep the prices low,” Kohn said of items in the shop. Gibson described the shop as more than just a place to purchase gifts. Thaler believes the shop was able to operate for more than a decade because of how well she, Kohn and Leach worked together. The decision to close the shop came after Kohn, Thaler and Leach felt they could no longer volunteer the many hours it took to keep it running. Attempts were made to find other volunteers to keep the shop open, but the project proved to be too big. After the shop closed and all of the remaining bills were paid, Friends still had about $15,000 left over. The organization decided to fund a large project at the library with the money. Mann said one of the most heavily requested items patrons have wanted was for additional genealogy resources. This led to the creation of the Cherry Hill Public Library Genealogy Research Center. The new center is located at the back of the library’s main reading room. It includes numerous genealogical books and magazines, but its biggest addition is digital. A significant portion of Friends’ $15,000 donation was used to purchase a two-year subscription to Ancestry.com’s library edition. This will allow patrons to research their family history at the library without paying the cost for an individual subscription to Ancestry.com. The new center also includes two computers, two Chromebooks, a scanner and new furniture. To honor the Friends’ gift shop for its donation, the center was dedicated to Kohn, Thaler, Leach and all of the gift shop’s volunteers. Cherry Hill Public Library Board of Trustees member Monas Noyes and Mann both said the impact of Friends and the gift shop is immeasurable. “We never would have been able to have done it without the shop and the Friends,” Mann added.